To C to C or Sweep, how do you know which roll is right for you? I can truly say that I like and use both and that it’s unique to each person’s physique and boat. I am a petit person (5’ 0 “) with decent flexibility. There are various boats I find easier to roll with a sweep than with a C to C and vice versa. For example - some Freestyle (whitewater) kayaks with planing (flat) hulls, hard chines, and bulbous middles, are more challenging for me to roll using the C to C. Because of the boats box-like design and my compact stature, I sometimes find it hard to contour my body around the boat and to get my paddle up high enough. So in this case I use the sweep roll, because it does not require the same degree of range of motion and extension. For someone who is taller and has good flexibility this might not be a problem for them. 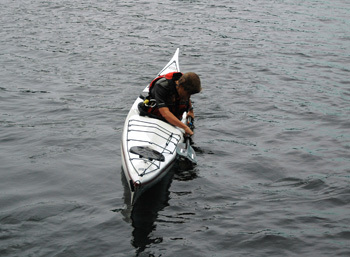 When I roll my Romany LV Sea Kayak (shown in the pictures below), however, it’s a different story. In comparison to the kayak(s) I mentioned above, this boat has a displacement (rounder) hull, softer chines and is low volume. Because of the boat’s design, I have an easier time contouring my body around it and rolling up, whether I am doing a C to C, sweep, hand roll, etc. So, when I am in the Romany or boats with similar characteristics, my roll of choice is usually the C to C, probably because it is the first roll that I learned and the one I’ve spent the most time on. As a general principle, the C to C works well for flexible paddlers and displacement hull kayaks and the sweep roll works well for paddlers with limited flexibility and planing hull kayaks. I recommended taking a lesson from a qualified instructor, trying them both, and then picking the one that works best for you and your boat. The set-up is the starting point for the Sweep and C to C roll. It’s a position that helps orient you to the surface, as well as protects the torso and head. When you’re practicing try not to rush this step. Go over, slowly count to three, and make sure your paddle and body is in the right position before moving on. By doing it slowly and methodically you will be able to develop the proper muscle memory and avoid potential shoulder injury. Below I have listed some of the key points essential to a good set-up position. Shaft horizontal & parallel to the side of the boat (left side). Rests on or above the surface of the water. Pressure on both thigh braces and foot pegs to maintain contact with outfitting and to stay in boat (imagine pulling with thighs to curl upper body into a sit-up position). 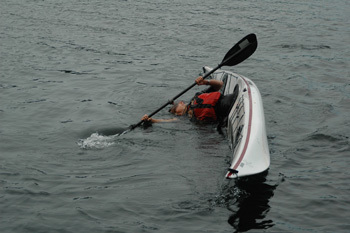 Boat rotation, body rotation and the path of the paddle are three of the main components involved in executing the roll. In a right-handed sweep roll the boat rotates up and to the left, while the torso and paddle link together and rotate out and to the right. 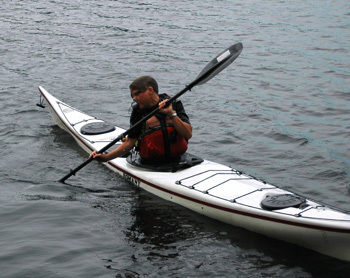 When done simultaneously you and your kayak should be upright and centered at the end. 1. Boat Rotation: To rotate the boat back underneath you, leg movement and hip rotation needs to be initiated at the very beginning of the sweep and continued throughout the roll. Use your legs and lower body to “corkscrew” the boat forward and off of you. (1 st) Apply pressure with your left foot on the foot peg, like you are trying to push the boat forward. (2 nd) Apply pressure with your left thigh (on thigh brace) and hip, like you are trying to lift the boat off of you and then back underneath you. (3 rd) Apply pressure with your right foot on the foot peg, like you are trying to push the boat forward. (4 th) Apply pressure with your right thigh (on thigh brace) and hip, like you are trying to lift and bring the boat back up underneath you. Throughout the sweeping action, lay your right ear on your right arm (or close to it). By connecting your ear to your shoulder this will help you to maintain the linkage between your paddle and torso. Look. Keep your eyes on your paddle throughout the roll. Look up to the surface, out (at the paddle & the horizon line) and then down at the paddle once the boat is back underneath you. Another trick I do is to blow bubbles in the direction of the paddle throughout the rolling sequence. This not only helps with linking, but also in keeping the head down. Try to imagine that your torso is floating on the water, like a feather or that your upper body is like a wing of a bird. As you sweep, extend your upper body up, out and away from your kayak before bringing it back into the center of the boat. Extend your right arm up and out during this phase, while keeping your left arm bent and close to the torso and boat. 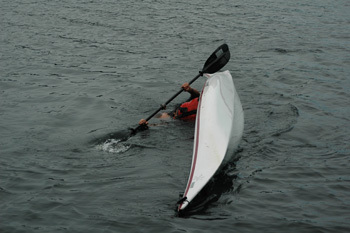 a kayak just with boat rotation, body rotation and their hand for support and extension. let your upper body and lower body to do most of the work. Keep the sweeping blade flat and parallel to the surface. Avoid pulling down on the paddle (especially at the start of your roll). 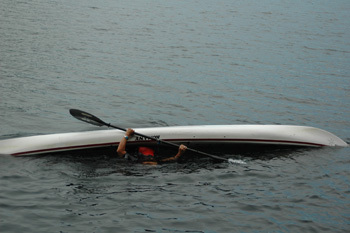 This is a common problem with paddlers learning to roll. Extend the paddle up and out with your body. Once it reaches 90° (perpendicularto the boat) and your boat is coming back underneath you, draw the paddle in. At this point your boat should be back underneath you, your body upright, and your elbows drawn into your sides. A proper Finish position puts you in a ready position for another stroke, minimizes the exposure of your upper body and protects your shoulders. There are variations to the sweep roll where you finish up laying on your back deck and that Finish Position has its pros and cons. I prefer teaching (at least initially) the one shown below for reasons that I have already mentioned. *The head comes up last. 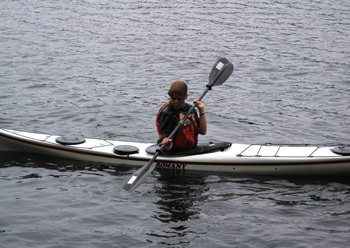 Moving the head from a position over the water to a position over the kayak occurs as a consequence of the kayak rotating underneath the paddler. Kent Ford’s DVD – “The Kayak Roll” is an excellent resource on the sweep roll.